A pre-workshop task had been set, and this was revisited later in the day with exciting results and a final group discussion. Throughout the workshop participatory sessions gave participants the opportunity to explore the psychology of type first-hand, and compare their answers to research results. Theory sessions were balanced out with experimentation, creative drawing and design thinking challenges. The workshop began with the simple question “why is typography important?”; we then covered the psychology of reading; a typographic life drawing session; the type consumer or user’s experience; influence, mood and personality. A final creative challenge gave participants the opportunity to put all they had learned into practice and to sketch out their ideas and to present them to the group. Sarah Hyndman worked with all of the team members throughout, giving critical feedback, suggestions and encouragement and creating a non-judgemental environment that even the most reluctant felt inspired to experiment in. What will you change about the way you work as a result of the workshop? “Sketch more!” Steve, Lead UX/UI designer. “How quickly I can explore design ideas with paper and pencil” Daniel, UX designer. “To consider the audience and context of the message first” Warren, UI designer. “Consider user perceptions of fonts, not just the designer perception” David, UI designer. “How typography can convey a message without needing extra graphics/visuals” Richard, UX designer. “Think more about my font choice and its impact on the consumer” Charlie, Graphic designer. “When to use serif/sans serif type” Warren, UI designer. “Brilliant”, “Inspirational”, “Excellent”, “Insightful”, “Informative”, “Fun”, “Refreshing”, “Hands on”, “Useful”, “Great”, “Awesome”. In today’s Information Age, reading has become one of the primary ways we gather information. This puts typography at the forefront of the essential skills any designer must master in order to communicate effectively. Reading creates the illusion it is a simple, effortless and automatic activity but the process builds on complex cognitive, linguistic, and social skills developed at an early age.1 Our non-conscious brain performs the task of reading. Here, the visual appearance of words communicates a great deal of information independently of what they spell out, and this happens without our conscious awareness. This enables type to take a short cut direct to the non-conscious brain, where it is estimated that 85% of our decisions are made.2 Typography is the technique of arranging type to create written language. When done well it gives the impression that type is ‘invisible’ because our eyes can glide, seemingly effortlessly, across the page. However, when typography is just designed to be easy-to-read it misses the opportunity to connect with readers on a deeper, psychological level. Type is a powerful tool that can influence the meaning of words; establish trust; emotionally engage; give words a personality and a backstory; enhance experiences and impact a reader’s behaviour. Why a Type tasting workshop? Invest in your team’s continuing development with a Type Tasting workshop. Join innovative typography expert Sarah Hyndman for an immersive session away from the computer. Sarah takes typography, a fundamental building block of design, as the focal point for an intensive creative refuelling workout and knowledge refresher. This is a team session away from computers with a series of activities involving creative thinking and doing. Participants will take home ‘tasting notes’ for their future reference. The workshop is tailored to you following an initial discussion about your workplace, how you work, and what skills you would like the participants to develop. Duration: One or two day workshop. Flex your team’s design thinking abilities as they investigate the user experience of typography, and its role as an essential design tool. 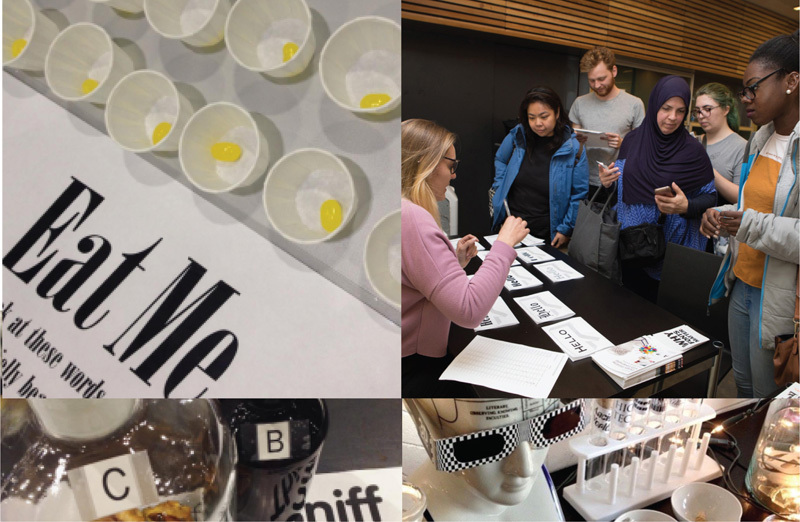 This workshop combines a design thinking challenge, with hands-on typographic explorations, lashings of theory, and latest thinking in type perception for your team to take back to their desks. • a fast paced and fun session away from the computer, experimenting with design thinking through typography. • understand how the psychology of the user/type consumer experience of typography can inform design solutions. • gain a greater awareness of using type to emotionally engage with the audience. • broaden your vocabulary of type styles and combinations. • refresh the team’s sketching and creative idea generation skills. • benefit from a day of team building and professional development. • demystify the language of typography by adopting visceral descriptions from the type consumer vocabulary. • enjoy a fun session that energises the team and leaves them feeling inspired about typography. Autotrader; BBC; Cass Art; D&AD; Ecole Intuit Lab, Mumbai; Interbrand; JML; M&S; Mindshare; Monotype; Save the Children; South by Southwest (SxSW), Austin, Texas; VIA University College, Denmark; V&A; Virgin Active. 1. How psychological science informs the teaching of reading by Keith Rayner, Barbara Foorman, Charles A. Perfetti, David Pesetsky and Mark S. Seidenberg. 2. “At least 85% of human decisions are governed by the non-conscious” Buyology by Martin Lindstrom. 3. Results of Sarah Hyndman’s Font Census research are incorporated into the results. 4. “People-based marketing is the future” Brian Boland, Facebook vice president of ads product marketing, Adweek. 5. If more senses are stimulated an experience can become intensified and the learning is considerably more effective. Approaches to training and development by Dugan Laird, Perseus Books. 6. Brand Sense fMRI studies compared responses to identical information presented on screen and on paper, in conjunction with Oxford University. 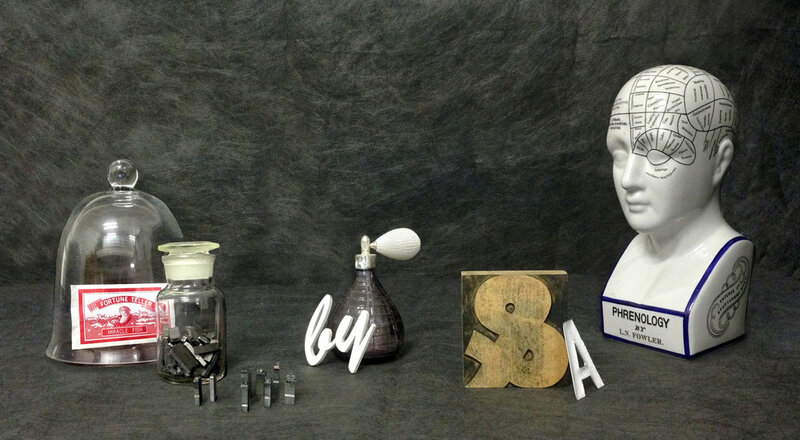 Type Tasting offers a selection of workshops. Would like to arrange a workshop for your company?